Right now, California&apos;s values are facing major threats from Washington, D.C.
Our president has denied climate change&apos;s effects and targets the most vulnerable with unjust policies and bigoted rhetoric. If the White House isn&apos;t going to protect all Americans, we need to count on each other to take a stand and do our part. Gavin&apos;s promised to resist any attempt by the Trump administration to take the state backwards. As a proven progressive, he&apos;ll ensure California stays on track. Gavin&apos;s campaign is working hard to get out the vote for Democrats across CA, but we can&apos;t do nearly enough without you. 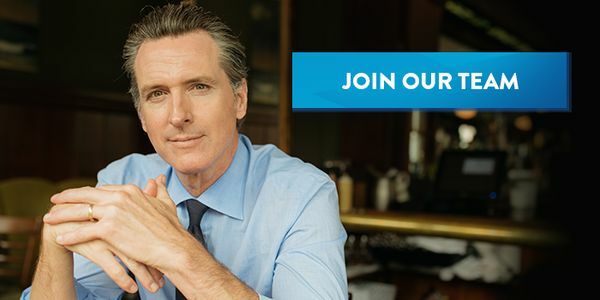 So we need your help: Add your name to join our campaign, and help us drive turnout that will keep California moving forward and put a check on Trump in Congress. Join Gavin&apos;s campaign and fight the backward policies coming out of Washington D.C. Let&apos;s choose bold leadership.